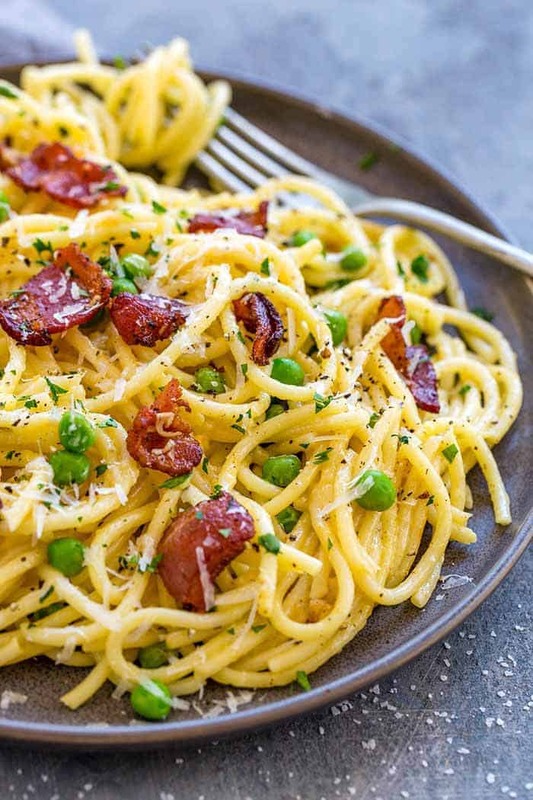 Pasta Carbonara is a favorite Italian dish made with wholesome ingredients. The creamy sauce is made with eggs and Parmesan cheese, using a special technique to ensure a smooth and luscious texture. Spaghetti noodles are topped with chopped bacon and sweet peas for the ultimate comfort food. Hi there! 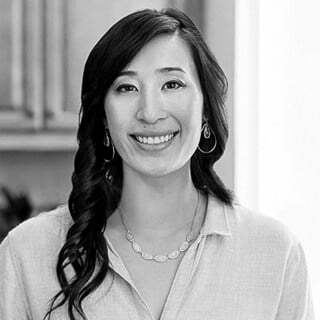 It’s Jessica Gavin, Certified Culinary Scientist and I’m thrilled to share this classic pasta carbonara recipe made with simple and flavorful ingredients. Tender spaghetti noodles get tossed in a creamy homemade egg and cheese sauce. The eggs add richness and body to the sauce. However, care must be taken to ensure that it stays smooth and not clumpy. Learn the easy techniques on how to make a delicious sauce without the worry. I remember my first plate of spaghetti carbonara many years ago in Rome. Since that day, I was determined to make a homemade version so that I could relive that culinary moment. Little did I know that the recipe contains just a handful of ingredients, eggs, Parmesan or Pecorino Romano cheese, garlic and savory pancetta. Because I always have some on hand, I use aged Parmesan and thick cut bacon. The crispy bacon and fragrant minced garlic create the beginning of the sauce base. The tricky part of the egg and cheese-based sauce is not to scramble the eggs! This process can happen if the heat on the stove is too high, as whole eggs curdle between 144 and 158° F. To remedy this issue once the pasta and sauce are combined and cooking, constant stirring and heat control is needed to keep the sauce smooth and velvety. Stirring distributes the heat and prevents hot areas. If the sauce is ever allowed to sit, it will solidify. To gently cook the sauce, a little bit of hot pasta water is gradually added and stirred into the pasta and sauce mixture. This technique helps to temper the eggs, as well as the starches in the pasta water coats the proteins in the eggs, making it more difficult to curdle together. To finish cooking the sauce, instead of heating directly over an open flame, the pasta in a metal mixing bow is set over the pot of pasta water to create a hot water bath or bain marie. The bottom of the bowl should not touch the boiling water. There should be a space for steam to be created and heat the bottom. As the bowl gradually heats up, the eggs cook and thicken with constant stirring until each noodle is coated with the creamy alla carbonara sauce. The flavors of the smoky bacon, minced garlic, and nutty cheese infuse into the spaghetti noodles, making you wish the pasta wouldn’t disappear so fast from your plate! This easy pasta carbonara recipe is a satisfying dish that the whole family will devour! I like to serve it with chicken marsala or slow cooker meatballs when I’m making a bigger feast. I’ve even added sauteed chicken breasts and scallops to the pasta for extra protein. 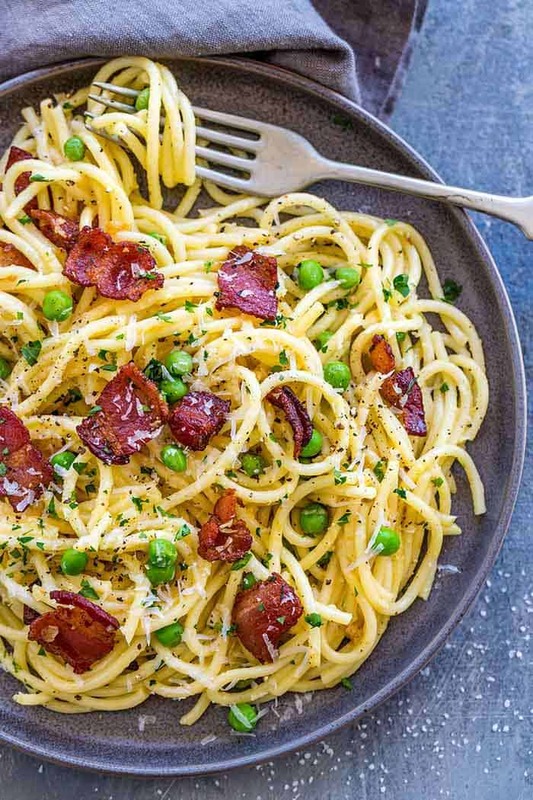 No matter how you make it, carbonara will become a new favorite dish to add to the dinner rotation. Bring 4 quarts of water and 1 tablespoon salt to a boil in a large pot. Add pasta to the boiling salted water and cook until al dente, about 10 to 12 minutes. Reserve the hot pasta water. In the meanwhile prepare the bacon. Heat a large pan over medium-high heat. Add olive oil, once hot carefully add the chopped bacon. Saute until crispy, stirring every minute, about 6 to 7 minutes. Drain off excess bacon grease, adding back 2 tablespoons grease to the pan. Heat pan over medium-high heat, add the garlic and saute until fragrant, 1 minute. Add peas to the pan and cook 30 seconds, stir to combine. Turn off heat and set aside until pasta is ready. Heat pan with bacon and peas over medium heat. Add the hot pasta straight from the boiling water into the pan, reserve the pasta water. 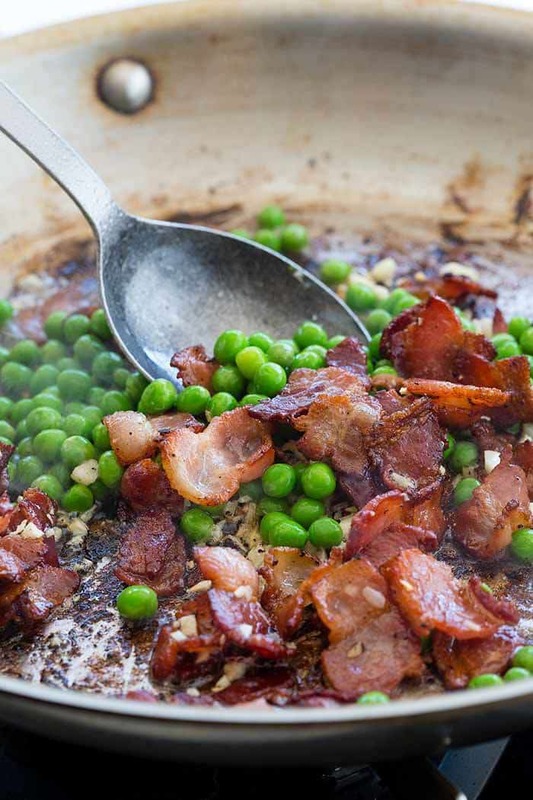 Toss the pasta with the bacon and peas for about 2 minutes. Turn off heat. 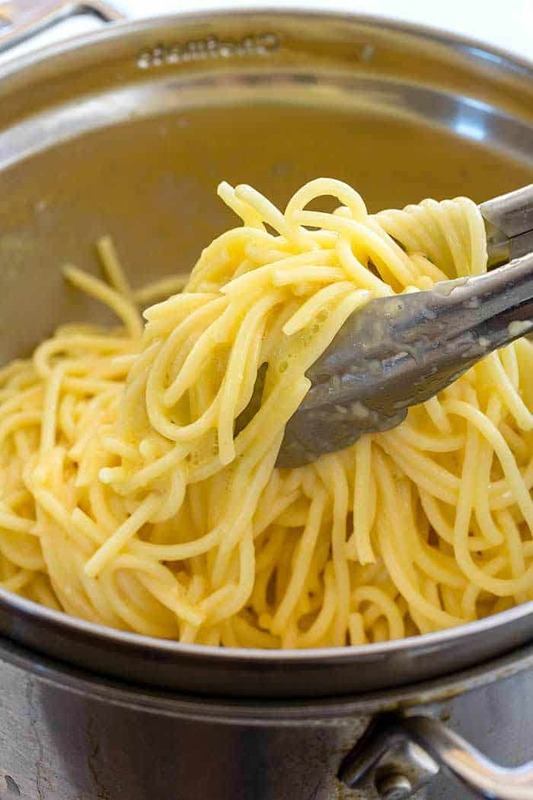 In a large metal mixing bowl beat the eggs and parmesan cheese together with a whisk. Add pasta mixture to the egg mixture and stir to combine until noodles are coated with the sauce. Very gradually add and mix ¼ cup pasta water to the noodles. Stir constantly to combine, until a lightly thickened sauce is created that coats the pasta. Place bowl of pasta over the pot with boiling pasta water. Make sure that the bowl does not touch the water, discarding some water as needed. Toss and stir the pasta frequently until the sauce thickens, looks creamy and coats the spaghetti, about 1 to 2 minutes. Make sure to stir and incorporate the sauce on the bottom of the bowl so it does not curdle. Taste pasta and season with salt and pepper as desired. Serve immediately topped with parsley, parmesan cheese, and freshly cracked black pepper. I don’t usually write reviews, but this recipe definitely deserves one. Simple, easy, & delicious. My family thought it was amazing!! Definitely making this again soon. hey girl- this just looks amazing! yummy! Delicious. Entire family loved it. I don’t understand the part about putting the bowl over the pasta water?? Never seen any recipe that said to do this. Why couldn’t everything just be heated in the pan?? This is a great recipe! I loved it! I also made homemade focaccia with it. It was perfect.